Where many judges are corrupt, like in Michigan, he who represents himself in court keeps crooked lawyers unemployed. 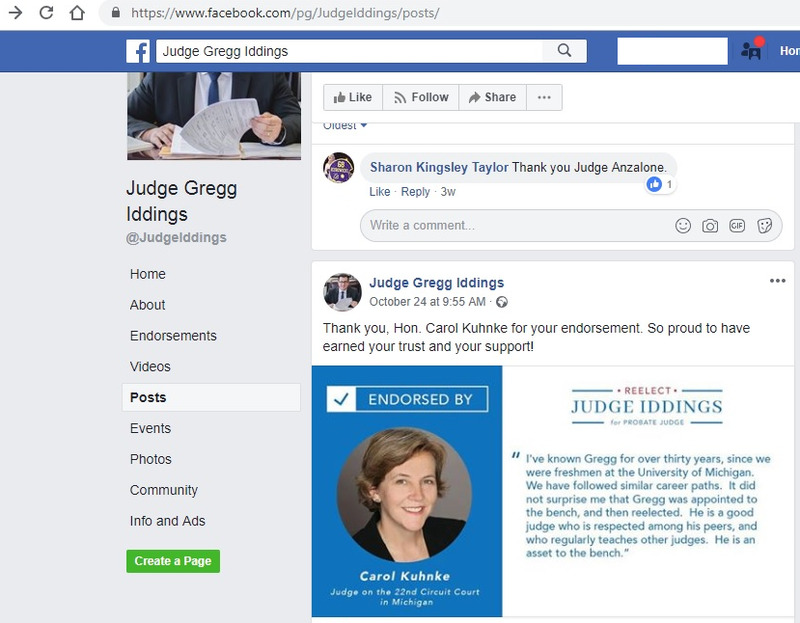 Judge Carol Kuhnke's Imbecile Endorsement of A Sexual Harasser for Re-election. On July 6, 2017, the Michigan Supreme Court ("MSC") sanctioned judge Gregg Iddings with a six-month suspension (that is, unpaid and undisturbed vacations) for sexually harassing his secretary in the course of three years. 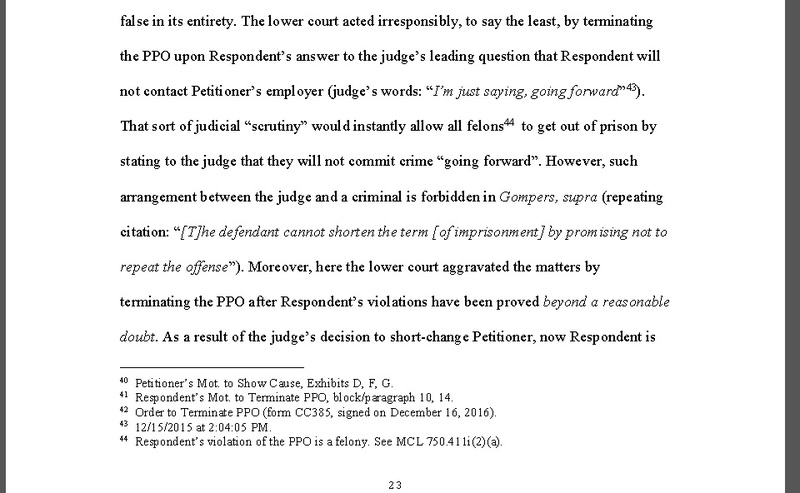 This is one of the rare instances where the Judicial Tenure Commission ("JTC") reacts to judicial misconduct, and it is even rarer from the standpoint that the MSC increased the suggested sanction as opposed to reducing or eliminating it: Let's not forget the Michigan Supreme Court's gross leniency toward furious judge Gorcyca's jailing of three innocent kids. Although several men are falsely accused (and even falsely prosecuted) for sexual harassment, according to In Re Iddings, respondent Iddings himself "stipulated to [the] findings of fact and conclusions of law". Also, it was Mr. Iddings who reported himself with the JTC, but apparently only after the EEO ruled in favor of the secretary. Mr. Iddings must have calculated that the publicity and repercussions of his misconduct would be lower if he reported himself with the JTC. her vexatious insistence to continue presiding Washtenaw County case 16-870-FH (where the police who busted her is a witness in that case) and which she keeps delaying and rescheduling two years later. Rather than felon Kuhnke, it was the special prosecutor who reported Kuhnke's narcotics felony (and only that misconduct) to the negligent Judicial Tenure Commission. Judge Iddings's six-month suspension became effective July 5, 2017. This means that he must have been back on January 5, 2018, or shortly thereafter. By January 19, 2018, he had already filed for re-election, thereby showcasing judges' addiction to power. 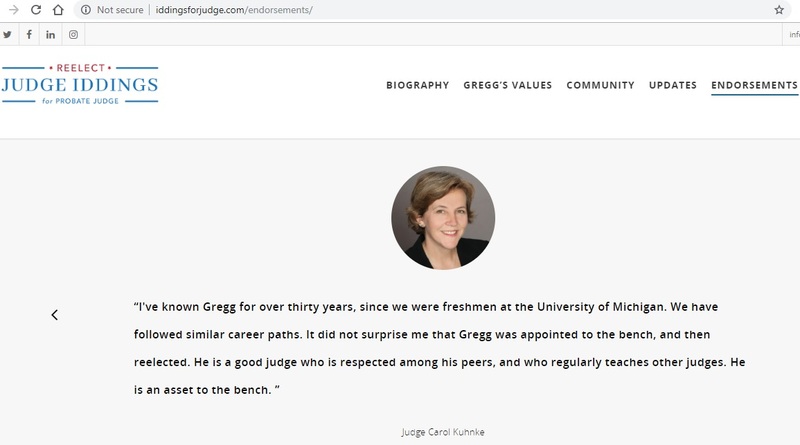 On or around October 24, 2018, few days prior to the November elections, judge Kuhnke could not dissimulate her love of "anybody who's powerful" (her words on the bench, not mine, at a hearing in 2016) when she publicly endorsed judge & school buddy Gregg Iddings for re-election. Notice this felon's need to remind us that she is a "judge", as if the five-letter word sufficed to legitimize someone's nefarious preferences. Or was it Mr. Iddings who added the judge prefix? Feel free to ask him via facebook or at info@iddingsforjudge.com. Felon Kuhnke's endorsement serves to highlight her hypocrisy and multi-faceted contradictions. When this criminal was pandering for votes back in 2012, she underlined the importance "that a woman's voice be heard in all of the matters of society, including on the bench". If she wanted, female Kuhnke could have advanced that importance by contending against male incumbent Timothy Connors in 2012. Instead, she came up with that babbling in her quest to replace a female retiring judge in that same electoral process. And for that same vacant spot there was another contender who was female and democrat, just like felon Kuhnke. But that is water under the bridge. 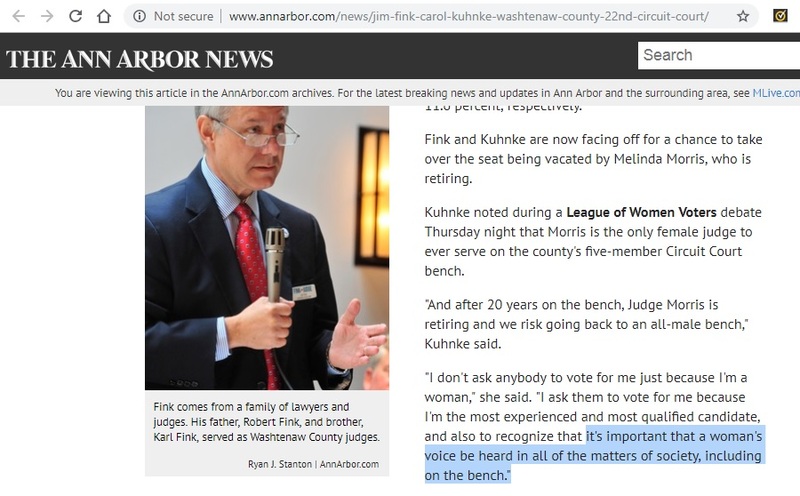 What matters is that nonsense Kuhnke's endorsement of a male judge who sexually harassed his female employee from 2012 to 2015 clearly contradicts her feminist pledge during the debate at the League of Women Voters. I doubt that felon Kuhnke would risk with that endorsement if her re-election were at stake in the elections of November 2018. 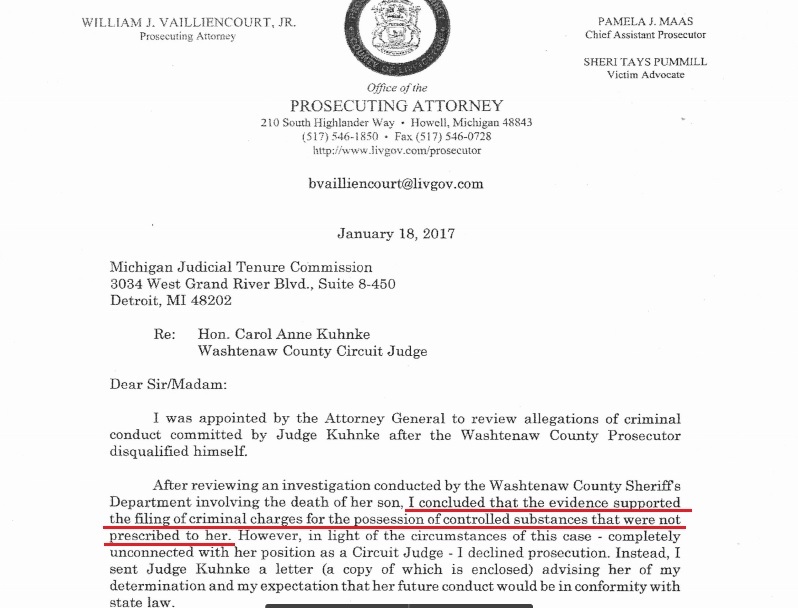 But since no eligible attorney in Washtenaw County dared to contend against either of these two incompetent crooks (Kuhnke and Connors), Carol Kuhnke feels the liberty to cheer the judicial ambitions of a sexual harasser. That is one of Carol Kuhnke's "values". 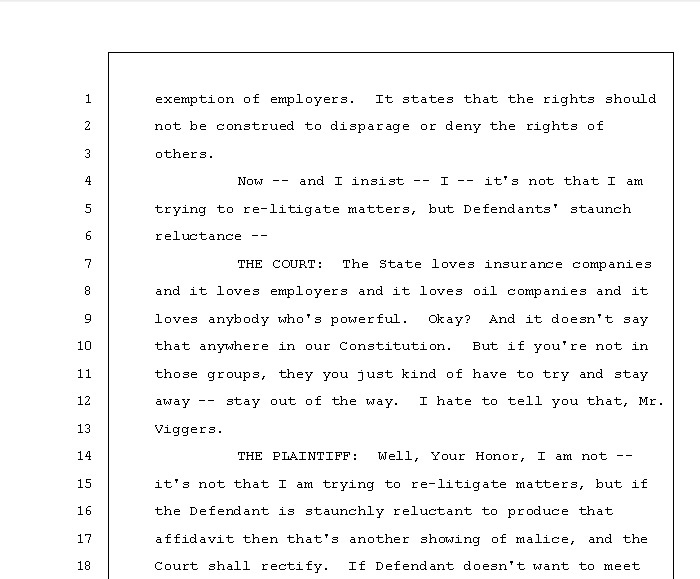 Now that I feel totally safe milking the system as judge, I "hate" to tell you that MI-chigan (actually meaning ME) loves employers and it loves anybody who's powerful. Okay? So if you are not in those groups, you just kind of have to stay out of the way. I don't care if my buddy judge incurs multi-year misconduct, because so do I with all the alcohol and illegal narcotics I have stashed till the police busted me. But I am not biased against you. It's all about who earns high income and who can help my career ambitions, and I just perceive that you are in neither category. 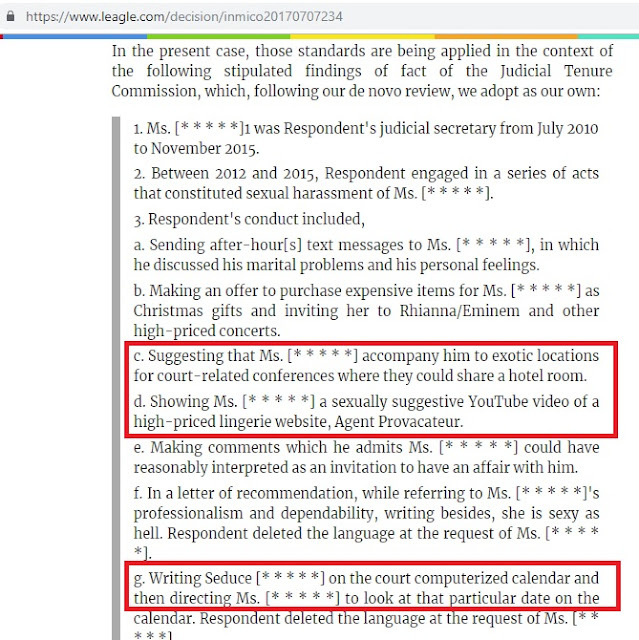 For these reasons, I am definitely siding with an abusive judge rather than with some secretary who shall endure this multi-year sexual harassment in order to make a living. That's my ruling. 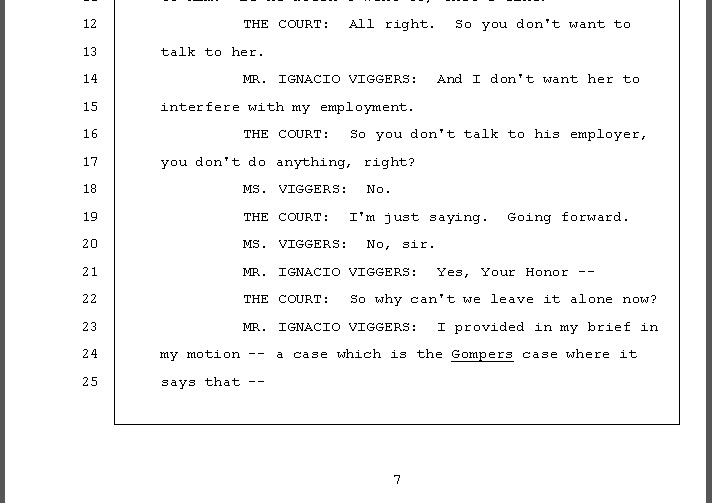 No wonder why inept judge Kuhnke favored defendant Maria de la Merced Viggers, the psychopath who kept harassing the University of Michigan over and over again (also by email) prompting it to irreversibly suspend my hire process there, and who is known for her troubling habits such as videotaping her neighbors as she drives and "beating on neighbors doors in the middle of the night [...] on a regular basis waking up the neighborhood at 4-5am". Many of Carol Kuhnke's pathetic decisions show her fondness of harassers and criminals. The good news is that judge Iddings lost his bid for re-election. He was defeated by candidate Catherine Sala. Given the circumstances, though, I find it appalling that Ms. Sala won only by a very small margin: 17,278 to 17,171. That is one aspect reflecting the unfortunate traction by Michigan's unfit judiciary. Regardless, future judge Sala is strongly encouraged to be an exception to the judicial debauchery and instead be a judge who actually follows the law. Now judge-elect Sala can expect, sooner or later, some kiss-up gesture by Carol Kuhnke in an attempt to mend the embarrassment of unavailingly siding with Sala's male opponent. The day that uncomfortable exchange takes place, Kuhnke's 30-year acquaintance Gregg Iddings will be a 'nobody' in Kuhnke's priorities. Ridiculous. What do judges Carol Kuhnke and Glenn Devlin have in common? Aside from their names having same length, that both Glenn Devlin and Carol devil release defendants strictly guided by these judges' own perversity. Last week Texas judge Glenn Devlin released several defendants shortly after losing his bid for re-election. In other words, he had one of those Carol Kuhnke episodes which was induced by enough voters not liking him. Unlike Harris County, where judge Devlin failed to secure his judicial perpetuity, felon Kuhnke's re-election in Washtenaw County, Michigan, was not at risk this time. That is because every eligible lawyer inexplicably declined to contend against felon Kuhnke, whose deplorable history includes --but is not limited to-- getting busted for illegal possession of narcotics while her adopted son overdosed and was dying elsewhere (coincidentally, another victim of Carol Kuhnke's pattern of inept decision-making). According to various sources reporting on this post-election issue, judge Devlin contented himself with the defendants' bare statement that they do not intend to kill anyone. 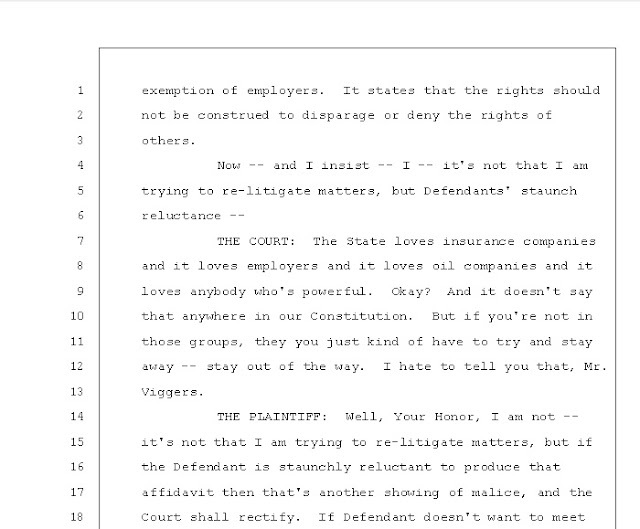 That opposite of "judicial scrutiny" reminds me of the criminal contempt hearing for Personal Protection Order 15-941-PH (Washtenaw County Trial Court, Michigan), where incompetent judge Timothy Connors asked his dear respondent Maria Viggers, my father's second wife, whether she intended to continue messing up with my employment (as judge Connors "diligently" clarified: "I'm just saying. Going forward."). That is funny because I actually briefed on appeal (on page 23) my criticism of that aspect of Connors's incompetence. Judge Devlin's decision to personify two years later the absurdity I criticized back then is not a prophetical skill of mine, but a sign of the judiciary's relentless unfitness exacerbated by their corruption and excessive power. Interestingly, judge Connors was the other incumbent in Wasthenaw County with the same luck as felon Kuhnke in these elections of November 2018: No eligible lawyer contended against him either. Something very bad must be dominating the Michigan courts that leaves these crooks' judicial ambitions completely and bizarrely undisturbed. Glenn Devlin's reaction epitomizes the resentful tenant who purposefuly destroys the apartment from which he is about to get evicted. And the analogy is hard to miss: voters in Harris County decided to evict judge Devlin from the bench. But Devlin's pro-criminals retaliation is much more harmful than a resentful tenant's because thereby this judge has irresponsibly subjected the public to unwarranted danger by those who are being prosecuted for violent crimes including aggravated robbery. This not only constitutes unlawful retaliation against those voting for another candidate, but also treason against those who voted for him. It will be ironic if it turns out that anyone who voted for judge Devlin has been or becomes a victim of the defendants that he capriciously released. This is the type of crooks who, abusing the absolute protections of judicial immunity, keeps dismantling the rule of the law. If this guy goes back to practice law, I think any prospective clients should seriously assess the chances that this resentful lawyer would deliberately mess up their cases if/when he gets sanctioned or disbarred. Given the currently putrid state of the judiciary in the U.S., one has to concede that at least judge Devlin "tried" suggesting the defendants not to kill anyone. By contrast, felon Kuhnke is fond of releasing defendants without making even the slightest attempt to discourage them from resuming their unlawful activity. Of the two lawsuits I filed that were presided by this felon, she dismissed one of them and rushed out of the courtroom; and on the other one, she admittedly stayed in the courtroom but only to openly express her deplorable view that Michigan loves anybody who's powerful and that the rest of us have to stay out of the way as she favored the fraudulent and inconsistent defamer Al-Azhar Pacha. Best wishes to Harris County voters with their new judge. Meanwhile, six more years of judicial debauchery await Washtenaw County inhabitants with reelected-by-default Timothy Connors and felon Kuhnke. Masters of Engineering in Mechanical Engineering (Iowa State University, 2014-2015). Actuarial exams P/1, FM/2, MLC, MFE/3F, C/4 (Society Of Actuaries and the Casualty Actuarial Society, 2010-2011).